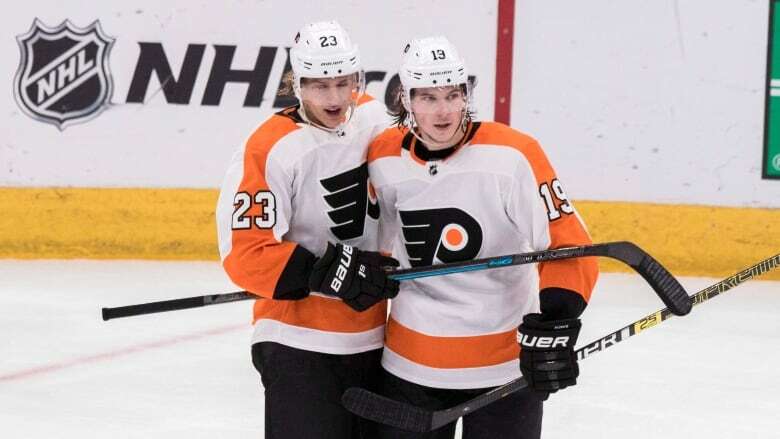 Nolan Patrick scored twice in the third period as the Philadelphia Flyers defeated the Montreal Canadiens 5-2 on Saturday night to extend their winning streak to three games. The league's worst power play continues to leave the Canadiens scratching their heads and looking for answers. A completely listless Montreal power play sucked the energy out of the home team and the Philadelphia Flyers rode that momentum to a 5-2 victory over the Canadiens on Saturday night to extend their winning streak to three games. Montreal was dominating the encounter until an ineffective two-minute man advantage midway through the second period. The Canadiens have the NHL's worst power play with a 12.6 per cent success rate. "I don't know," said captain Shea Weber when asked how the Canadiens could fix their power play. "You guys ask every game. I don't know. I don't have an answer for you. Wish I did. If we did, it would be fixed by now." The Canadiens, who were riding a season-long four-game winning streak, were outshooting the Flyers 21-9 when Jakub Voracek was called for interference on rookie Jesperi Kotkaniemi at 13:33 of the second period. Montreal (27-18-5) fired just one shot on net with the man advantage, though, a harmless wrist shot by Jonathan Drouin. The Canadiens have scored two goals on their last 27 power-play opportunities. They had an 0 for 25 stretch earlier this season. "The question's been asked of the players and they don't seem to have the answer," said coach Claude Julien. "We keep working at trying to find the answer. "It's hard to explain because we're a better 5-on-5 team with those same players than we are 5-on-4. Something there has to get better. The decision-making and the choices of plays have to get better. We're not a threat at all on the power play. Tonight was one power play and it was a dead one. Despite being heavily outshot, the Flyers (19-23-6) scored twice in a 1:33 span in the second period to silence the Bell Centre fans. Travis Konecny broke the deadlock, cashing in a rebound at 17:01 for his 12th goal of the season. James van Riemsdyk doubled Philadelphia's lead at 18:34 when he deflected defenceman Robert Hagg's point shot past Niemi. Nolan Patrick scored his first of two goals on the night on a 2-on-1 with Wayne Simmonds at 7:06 of the third period. The Canadiens replied instantly when Max Domi scored 30 seconds later with a wrist shot off the post, shortside on 20-year-old goalie Carter Hart. Patrick restored Philadelphia's three-goal lead at 9:31 with a shot in the roof of the net after a nifty dangle to avoid Brendan Gallagher's stick check. Brett Kulak got one back for the Canadiens with four minutes left on the clock, jumping on a loose puck in the slot before Michael Raffl scored the empty-netter at 19:08. The Canadiens dropped to 3-5-0 in the second game of a back-to-back series after defeating the Columbus Blue Jackets 4-1 on Friday night on the road. "It was all too little too late," said Kulak, who has three goals this season. "We didn't play our absolute best in the first but we thought we played well enough to establish a lead, which didn't happen." Hart, making his fifth consecutive start, stopped 33 shots while Niemi made 19 saves. "First period, obviously Carter gave us a chance to be even," said Flyers coach Scott Gordon. "That was a huge part of the game. They were the better team in the first period. It wasn't close. We got better as the game went on. We didn't have a whole lot going and we picked it up afterwards." The Flyers have now beaten Montreal in five straight games dating back to the 2016-17 season.